Frame #1: The right arm enters when the pulling left arm is widest from the mid-line. The left leg kicks to counter-balance the vertical force component created by the right arm. The upper left arm is being adducted. The external rotators of the left shoulder appear to be contracting more than the internal rotators since the angle through both shoulders to the left elbow is slightly less than 180 degrees. The head is buried well down. Frame #2: The right arm commences to cross inward and downward, a movement that is contradictory to the often-espoused "outward press" that is supposed to initiate an "S-shaped" pulling pattern. The left arm nears final adduction and the hand/forearm propulsive surface is rotated to facilitate elbow extension as well as being drawn in closer to the mid-line. The left leg completes its counter-balancing kick. The head commences to rise. The right leg prepares to kick. Frame #3: The right hand continues to cross inward, but at this stage, more downward. The left arm pushes back and up to virtually touch the left upper thigh as part of "rounding-out" in its exit. The head continues to rise and turn to the right. The right leg kicks to balance the vertical force component created by the extraction of the left arm. The shoulders are flat. Frame #4: The left arm starts to bend at the elbow and the upper arm begins to be adducted. Since adduction of the upper has its axis in the shoulder joint, and the upper arm is a fixed-length lever, the elbow will go out and then come back in as it is adducted in the shoulder from full forward to considerably backward. This outward movement is necessary so that both the internal and external rotators of the shoulder can contract to cause adduction. The outward and then inward movement is dictated by the human anatomy, not by some spurious argument about ill-founded ideas of "lift" production. The head is turned to the right to prepare for inhalation. The right leg kick is completed and the left leg begins an abbreviated "stab" kick. The left arm is almost clear of the water. The shoulders dip to the right. Frame #5: Vigorous right arm adduction continues. Continued adduction produces the widest part of the pull. The position of the hand/forearm surface is dictated by the swimmer's anatomy and musculature. The left leg completes its kick and the right leg prepares to kick. The recovering left arm is out of the water. Inhalation occurs. The shoulders are almost at their furthest rotation to the right. Frame #6: The propelling arm is drawn back under the body as adduction is in its latter inward stage and the shoulders have rotated fully to the right. The line between both shoulder points and the elbow is almost straight indicating the large muscle mass that is being used in this pull. The head has just started to return after inhalation. The right leg kicks to balance the vertical forces created by the recovering left arm. Frame #7: The head has returned to look down into the water. It is lowered in concert with the right arm recovery that is approaching the water surface. The propelling arm is well under the body and extending at the elbow. The right leg kick is completed. The left leg kick commences to balance out the upward and backward "rounding-out" action of the exiting right arm. The shoulders have rolled to an almost-flat alignment. Frame #8: The left arm enters the water at full stretch. The right arm completes its propulsive phase and will soon round-out. The head is buried and looks almost directly to the bottom. The left leg kicks to counter-balance the exiting left arm. Frame #9: The right arm exits vigorously as the left leg completes its kick. The hips have rotated to allow the exit to occur as close as possible to the mid-line of the system. The left arm vigorously presses down as the right leg kicks to counter-balance its vertical force component. The shoulders have rotated to the left quite quickly. Frame #10: The left arm propulsion has begun. The elbow bends, there is some medial rotation of the upper arm, and adduction commences. The right leg kick is completed to balance the increased vertical force created by the left arm pull. The head is still well down. The left leg is being positioned to kick. Frame #11: The left arm sweeps wide in its propulsion due to adduction. The stage of shoulder rotation causes the arm to go even wider. A striking feature of the pull is the emphasis on the contraction of external rotators that cause the angle between the shoulders and the upper arm to be less than 180 degrees. The head looks slightly to the left. The right leg begins to rise as the left leg commences to kick. The right arm is well into the recovery phase and has just passed the point of maximum height. Frame #12: The left arm adduction is finishing and the arm is just entering extension. The right arm is being positioned to reach over the water. The left leg kicks to counter-balance the right arm. Frames #13 and #14: The left arm is pulled under the body in the latter stages of its propulsive extension. The right is extended well forward and prepares to enter the water. From here on the stroke cycle (see frames #2 through #4) is repeated. 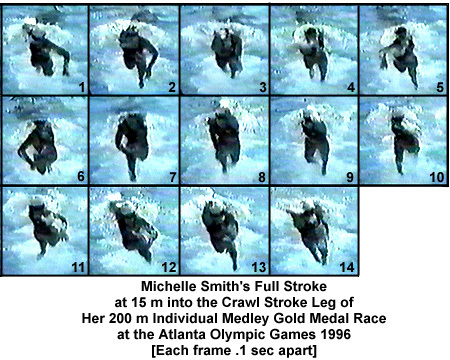 There are certain features of this stroke that make it understandable why Michelle Smith is an Olympic champion. Her pull is well under the body in its latter stages. This minimizes excessive lateral dissipation of force. All the musculature of the shoulders, the internal rotator muscles (anterior deltoid, pectoralis major, latissimus dorsi) and the external rotator muscles (infraspinatus, teres minor, supraspinatus) are used to perform a very vigorous and powerful underwater pull. On both arms the external rotators are emphasized more than the internal rotators. Shoulder rotation places the swimmer's anatomy into a good position. The head is well down which promotes high hips and therefore, good streamlining. Strong adduction provides power to the hand/forearm propulsive surface to produce a "long" propulsive phase in the underwater movement.